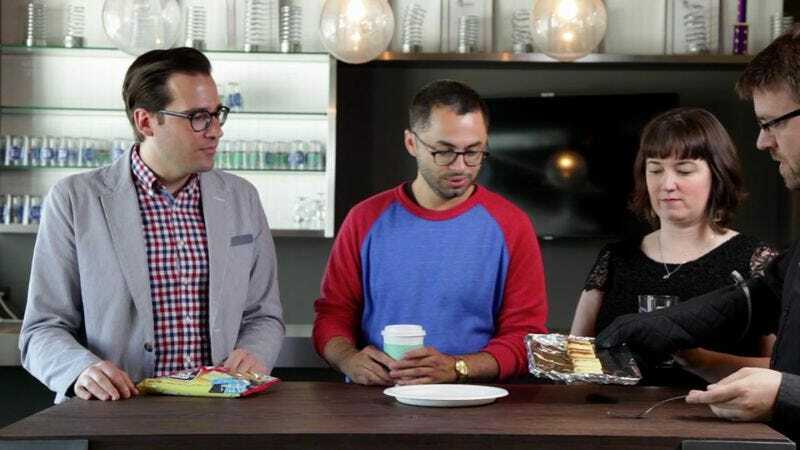 Last month, we lured comedian and Parks And Recreation writer Joe Mande to The A.V. Club headquarters with the promise of MmmHops, a pale ale made by the band Hanson. Unfortunately, the beer didn’t materialize in time for Mande’s appearance, but we made the best of it, digging into our bin of Taste Test alternatives and coming up with a kind of Japanese Kit Kat that you can ostensibly bake to a golden, brûléed brown. (You can also eat them without baking them, but they’re not nearly as good. Trust us.) With Josh Modell manning our kitchen’s disgusting toaster oven, we soldiered forth and ate the sweets. Unsurprisingly, they were good—good enough, as you’ll see in the video above, that we might have Mande back one day to toast up some other mass market candy with us. Joe Mande’s latest album is Bitchface, out now.